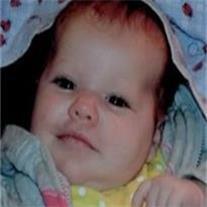 Haylee Belle Smith, infant daughter of Michael and Stefanie Smith, passed away October 7, 2013 in Gilbert, Arizona. Funeral services are Friday, October 11, 2013 at 11 AM, preceded by a visitation at 10 AM at the LDS Ashley Heights Ward, 1865 South Higley Road in Gilbert. Arrangements by Bunker’s Garden Chapel.